Community activists speak out! The latest news on the prison industrial complex, gang injunctions, Africa & the Middle East, youth organizing, immigration, education, and more. Live painting by Black Diamonds Shining. This area features dancers, poets, mc’s, vocalists, djs, and live music. Graf Court will hold an all-city graffiti battle throughout the day. 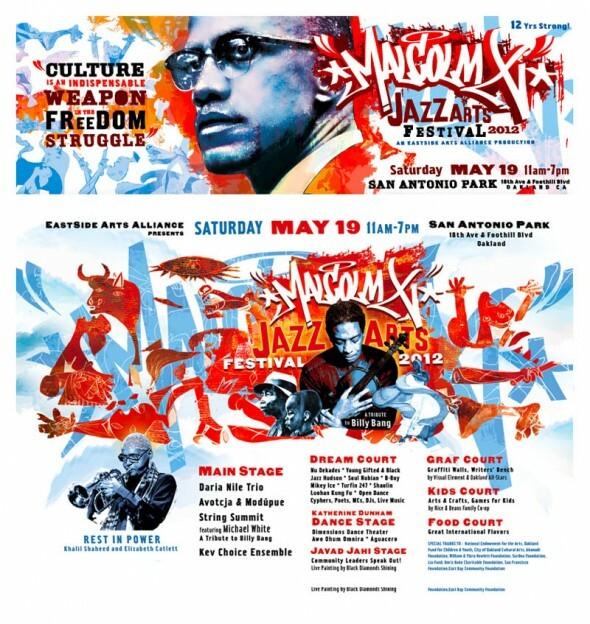 For more information about the 12th Annual Malcolm X JazzArts Festival, please contact EastSide Arts Alliance at 510-533-6629 or visit www.eastsideartsalliance.org. This entry was posted on Friday, May 18th, 2012 at 1:05 am. It is filed under Community, Festivals, Music News/Info, Oakland and tagged with 12th Annual, art, Avotcja, community, Daria Nile Trio, Eric Hunt, India Cooke, jazz, Kash Killion, Kev Choice Ensemble, Malcolm X JazzArts Festival, Modupue, Muziki Duane Roberson, Oakland, San Antonio Park, Sandy Poindexter, soul, Tarika Lewis. You can follow any responses to this entry through the RSS 2.0 feed.